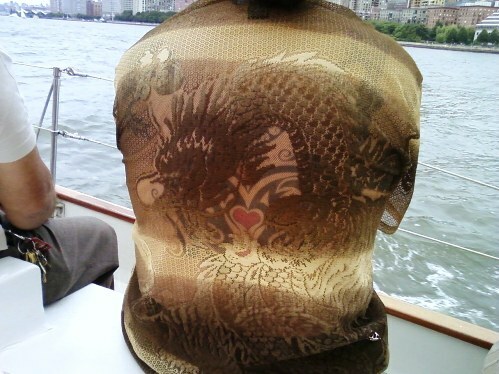 Bra police, or: Should you wear this on a sail boat? So, yesterday I went sailing around the isle of Manhattan, no it ain’t Capri, but what ever, and this 50 foot sail boat had 40 people, so you could say it was a little…PACKED. And I show up in shorts and a tank and this is fine and dandy for sailboat attire, but I look around me and feel a little under dressed. ’cause most all the other ladies around me are well turned out in cute little sundresses. And I’m like, well at least if the wind blows I am perfectly attired …but it didn’t much. Then I see this girl, and I’m sorry, but I just don’t get that whole bra-strap thing. So I was curious what you all thought about it. And then, just when I thought all was clear, I looked to my right, and there was a very nice man wearing a not so nice shirt that he must have found in his, well, somewhere…and I’m like, sail us back to Soho. Please.